Abigail and Dolley readers do you skip to the end of a book to find out what happens? Do you fast forward a movie to the closing scenes? If you've missed a TV broadcast, do you search for a recap or do you wait for the episode post? Most folks do not do any of these things, we enjoy vicariously watching others on their journey. We like the story, the struggle, the growth, and the journey; but most of all we love the happy ending. We know it's coming so we sit on pins and needles and watch the drama unfold. Why then, in our own lives, do we want to skip to the end? In our own lives, the struggle is not that much fun. We want to quickly skip through the pain and get to the good stuff. 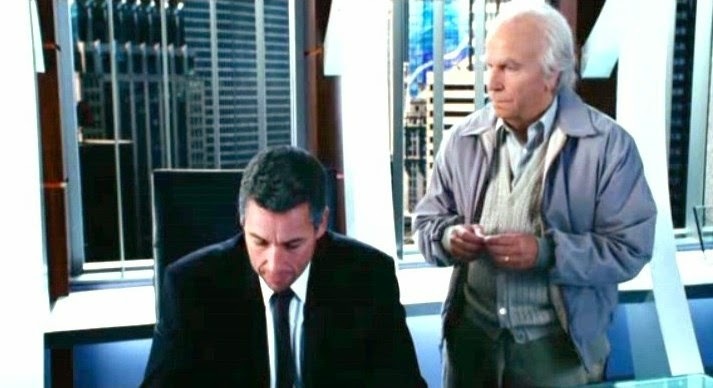 Several years ago, Adam Sandler starred in a movie where he found a remote that would speed up his life. At first, it was a blessing but towards the end it was heart breaking to see the result of a life not lived. As Christians, the Lord will not allow our story to unfold that way. In retrospect, most of the time, when we look back we would not trade who we became out of the struggle for an easier time. Even some of the toughest times, if given long enough will dull in pain and we can see God's hand on us: guiding, forming, and changing. We choose not to relive but we appreciate the journey. Friends, I am guilty of fast forward prayers. I am particularly impatient with long waits and no progress, like the camping section of Harry Potter and the Deathly Hallows. Languishing in the wilderness, isolated, confused, and tormented by the voice of the evil one - we desperately seek to escape those times but the Lord will use them for our good if we let Him. So appreciate the day, enjoy the journey, find joy in today. As Christians, we hold on to the certainty of a happy ending. "Dear Church - I am leaving you because.... you are hypocrites, your music stinks, you have a big stage show, you don't have a big stage show, you haven't kept up with the times, my needs are not getting met, somebody was mean to me, you ask for money, you stand up for social issues that make people not like you, your ushers wear suits... wah wah wah, whatever." We are not an Entertain Me Church, we are a serving church. We are the Body of Christ, a working body that feeds people and clothes them. We support missions and missionaries. We love each other and we love the Lord. If one of our members is having a problem, we gather around them and pray but we also give them a gift card to the grocery store and let them borrow a church van while their car is in the shop. If you would like to come and join us, you are welcome. We will pray for you and with you. We will call you by name on Sunday. We will invite you to Bible Study, Men's Group, Women's Group, Youth Group, Prayer Group, and Kid's Church. We will ask you to come and join us for a potluck, somebody might even bake you a gluten free cake. We would love to have you. We won't however, overhaul our entire system because your old church used to do it that way. We are sorry if that doesn't meet your needs. We won't give you your own special ministry when you have not shown up or participated in a single event we already have going on. We are sorry if that doesn't use your unique gifts and talents. We will notice if you do not come anymore and might even reach out to ask you back, but we are sorry if one Sunday the Pastor did not hear you when you said good morning. We won't compromise the Word of God, Jesus is pretty particular about adding or taking away Scripture, we are sorry if that makes us seem intolerant or not hip. We will walk with you in this life. We will support you during this journey, we will love you and laugh with you. We will ask that you walk with us, that you help support us - you see, we are supposed to belong to a Body. Belonging to a church is like being married, two imperfect beings coming together to love each other and make this life more fulfilling and pleasant. It takes commitment, it takes love, and it takes forgiveness. You can keep on church shopping, you can drop out and try to do it alone (even though that is not Biblical), you can watch your favorite preacher on TV every Sunday morning if you'd like - we are not going to force you to come but please do us a favor? Stop writing letters to us telling us how bad we are and why you aren't coming back, we've got too much work to do. Abigail and Dolley readers today we mark the three year anniversary of my Father's passing. It was a cold, clear, beautiful January day exactly like it is today. That he should leave us on such a day was a fitting tribute to him, because he was such a light in this world and his personality was bright and warm. The world is a sadder and darker place without him and there has not been a day that has gone by that I have not missed him and wished he was still here. I have come to realize a lot of things about grief these last few years and I'd like to share with you some of my lessons. The first lesson is that everyone has to grieve in their own way. There is no right or wrong way to grieve. A quick internet search will yield many articles on the stages of grief but it is important to realize that they are not linear, predictable, or all inclusive. A recently bereft person may go through three or four stages a day, some might never feel or experience one of the stages - grief is a personal thing. Next, grief has it's own timing. There is no chart that you can concoct that will say, you will grieve X amount of days for the loss of a parent, X amount of days for the loss of a spouse, ect. It will simply be a personal experience and no amount of time, either personal or arbitrary will change that. One of the best things I recall reading in the days afterwards were that you only get a chance to grieve right once. If you try to rush through, push it down, move on before it is time, it will spring up in unexpected ways and times and can truly disrupt or disturb the rest of your life. So do not rush this process, it will have it's own time whether you like it or not. The pain closet... We have within our brains a space where we keep our most painful memories. In the course of everyday life, we can walk by the closet, we know what is in there but we do not open the door. We do not go inside. When someone close to you dies, you have to go in there. You do not have a choice, this loss belongs in that space. If you are young, the closet might be empty, so you throw the item in there and shut the door. If the closet is neat and tidy, you can box up this grief, add it to the inventory and get the heck out of there! 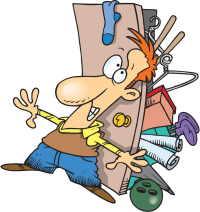 Unfortunately, most of us do not have a neat and tidy pain closet. Some will open the door and an avalanche will ensue. For those, there they stand with the deepest pain in their life surrounding them and the can not figure out why they are crying over something that happened 30 years before. Some will shove the new box into the closet and like a traveler sitting on a suitcase will force the bolts closed. Others may collapse in despair and stay in the closet way too long surrounded by misery. Still others, will pick up the pieces and arrange them orderly on the shelf because it is the right time and they are strong enough to do it. Again, each person is going to deal with this differently. Everyone who loved the deceased has a right to grieve. This is particularly sticky in the age of divorce or in the case of long term domestic partnerships. Ex's are not expected to mourn. If years have passed, it is even more shocking to them and everyone around them if they mourn deeply. There is a shame in this type of grief, especially if they are remarried. This was one of the most complicated aspects of the grieving process. Lastly, people in mourning may react inappropriately, they might say things they should not, they may snap and be angry. When the fog of grief begins to lift they may deeply regret those things, forgive them. Be ready though, because it can take you by surprise. In the end, you never get over it but you learn how to live with it. If you and your loved ones are believers and followers of Christ, take comfort that you will see them again. This is the greatest hope and the buttress that has seen me through. For there is no death for those in Christ, just a brief parting before we join them again. Abigail and Dolley readers I've been reflecting on Donna Douglas, the starlet who passed away last weekend. By all accounts, she was a lovely Christian woman of faith and integrity. Usually, I would read something like this, ponder it for a moment and then move on. Apparently though, the Lord wanted to bring something to mind and I kept thinking about her. Over and over again through the weekend, I found I was drawn back to her story and her character of Ellie Mae Clampett. Then it dawned on me, Ellie Mae was a tomboy and if she were alive today in Hollywood they would turn her from a beautiful young lady into a lesbian/transgender character. Our Tomboys are in danger. Girls of yesteryear who were rough and tumble were never told they were boys in girls bodies! We encouraged them to dress and act as girls, most grew up into fine ladies, wives, and mothers. They did not dress as men and have their breasts cut off and their genitalia mutilated. It is a dangerous time to be a tomboy today, because somebody is inevitably going to take it and tell those girls that they are lesbians or transgender. What a truly evil thing to do to a little girl. Instead, we should encourage them to enjoy catching frogs and building forts. We should let them get muddy and play sports but we should remind them that they are young ladies. We should teach them what a wonderful thing womanhood is and how God made her into a special person who will grow up to fulfill His plan for her. By rejecting God and all His ways, our minds have become depraved and we no longer recognize right from wrong. If you have a tomboy, nurture her and love her, guide her through this difficult culture. Pray and the Lord will give you sound guidance and do not sell her out to the lies of the age, protect her.